*Rates are cruise only per person based on double occupancy (with the exception of FLA & FLP categories) and quoted in USD. Offer valid for U.S. & Canadian residents. Government fees and taxes (GFT) are additional for each guest. Charlotte Amalie, U.S. Virgin Island is excluded for the February 16, 2019 sailing. COMBINABLE DISCOUNTS: One (1) of the following discounts may be applied as applicable per stateroom: MSC Voyagers Club Discount; Military Discount; Interline Discount. Applicable to active and retired U.S. and Canadian military, civil service and interline personnel and their spouses, dependent children, parents, and parents-in-law. Qualifying guests must present an I.D. badge from their respective organization at the time of booking. Take advantage of this limited time only Black Friday deal in addition to our AMAZING 2-for-1 cruise deals on MSC Divina Caribbean cruises scheduled for April-June, 2017! Kick-off the holiday season with Black Friday deals on Caribbean cruises. Sail on the ultramodern MSC Divina and experience world-class entertainment, authentic Mediterranean cruises and so much more all while cruising to the most stunning Caribbean destinations such as St. Thomas, Jamaica, Puerto Rico and more! Save 50% off brochure rates on Caribbean cruises PLUS shipboard credit, WiFI and a drink package* when you book now! Book now because this offer will not last! There's never been a better time to start planning your next MSC cruise! Choose between hundreds of departures on our most stunning ships sailing throughout the Caribbean, Mediterranean and Northern Europe. Book now and you'll save 50% with 2 for 1 cruise deals based on our brochure rates. PLUS on select sailings kids cruise FREE*! Prices are 2 for 1 in all categories compared to the Full Brochure rates for the 1st and 2nd passengers starting at $399.50 per person on selected sailings in the Caribbean between October 8, 2016 and February 25, 2018. Promotion expires: March 31, 2017. Get away from everything and let the soothing sounds of the ocean take your cares away as you relax your own place of zen one step outside your stateroom. Wake up, and pull back the curtains to a new breathtaking view everyday. From exotic tropical isles, iconic skylines to the calm expanse of the ocean all views are sure to impress. Sailing in a Balcony stateroom allows you to start the day with the crisp ocean air and breakfast on your balcony or order in and have a romantic dinner under the stars. Simply step on your balcony to sunbathe in private or enjoy a glass of wine while taking in the beautiful orange and red hues of the sun setting into the ocean. Take advantage of our special "Get It All" offer and sail the Caribbean in all the luxury of a Balcony stateroom at an unbelievable value. *Inclusive Rates Include: For Categories I1-B2, price includes for all stateroom guests More-For-Less Classic Unlimited Drinks, Surfer WiFi Package, $40 Shore Excursion Credit (max $160 per stateroom). For Categories B3 - YC3, price includes for 1st and 2nd guest only Surfer WiFi Package and $75 Shore Excursion Credit (Max $150 per stateroom). Tour Excursions must be booked on board to use included Shore Excursion credit. MSC Voyagers Club And Cargo Employee discount is applicable. A discount of up to 10% (not combinable with MSC Voyagers Club discount) is also applicable to active and retired U.S. and Canadian military, civil service and interline personnel and their spouses, dependent children, parents, and parents-in-law. Qualifying guests must present an I.D. badge from their respective organization at time of booking. Government taxes and fees for all guests are additional. MSC Cruises reserves the right to pass on any fuel surcharge without notice to all guests. Ask for “Best Rates” or “Best Rates All Inclusive” when booking. Offer Expires July 9, 2016. Ship’s registry: Panama. Check out our amazing last minute cruise deals on MSC Divina in the Caribbean. 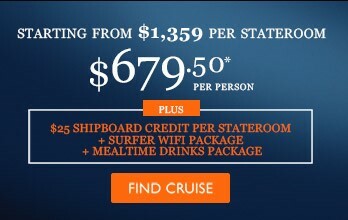 Book an Interior stateroom now from $449*pp. Enhance your experience and choose to cruise in the exclusive MSC Yacht Club - with newly reduced rates from $1999pp PLUS $300 shipboard credit per stateroom - and you'll receive personalized service from your very own butler and enjoy relaxing days spent in the private Top Sail Lounge and The One Pool & Bar. Limited time offer on last minute cruises: Apr. 23, 30 and May 7, 14, 21. Contact Enjoy Vacationing for more information today! 7-night Caribbean cruises starting from only $449*pp. Book a Balcony and receive up to $150 Shipboard Credit or book a balcony, suite or MSC Yacht Club stateroom and receive up to $300 Shipboard Credit. Plus Kids Sail FREE on select sailings: Apr. 23, 30 and May 7, 14, 21. 11-night Mediterranean cruises starting from only $899*pp for a Balcony Stateroom. A truly exceptional price for one of the most amazing itineraries in the Mediterranean which includes: Genoa & Civitavecchia (Rome) in Italy, Katakolon (Olympia), Piraeus (Athens), Rhodes & Herkalion in Greece and Haifa, Israel. Plus Kids Sail FREE!